Stolen from Pai on Facebook. Vitiligo is a condition in which the melanocytes in the skin and fur are unable to produce pigment. There are several reasons for this condition, including viral infections and autoimmune disorders. This is definitely not the same as the blue doberman, which is caused by it being a black and tan dog that is homozygous for dilution (d/d). That is just really strange looking! Is the viral version reversable or does the virus cause a permanent gene break as happens with tulips? 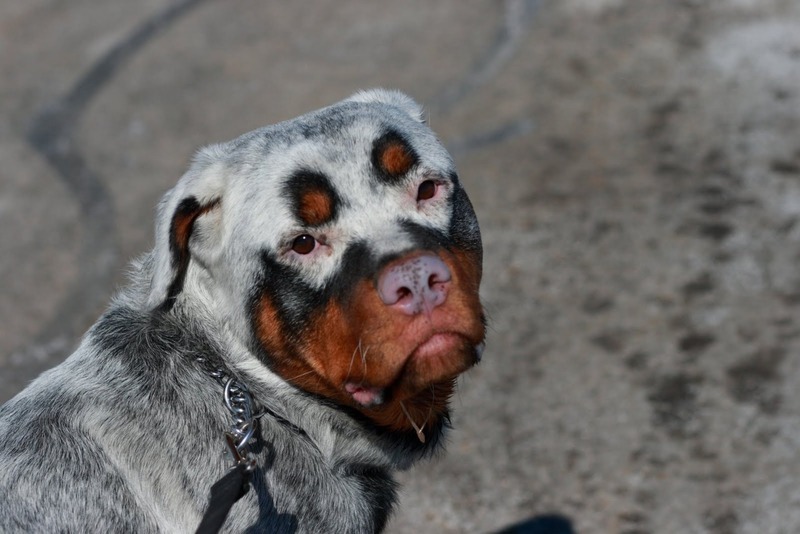 I don’t know which version of vitiligo this dog has. Whatever harms the melanocytes– it can be just about any pathogen or autoimmune disorder. I just realized that the grey portion is the same shade as that of the coyote in your previous post. on January 13, 2012 at 12:44 pm M.R.S. Odd, that the change has not affected the areas with red pigment in the hair, nor the black hairs bordering the red. Wow, that is so weird looking! I have never seen this in a dog before.